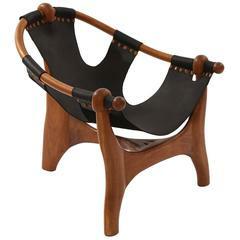 A fantastic, vintage, wood-framed, leather sling chair. A beautiful reduced form; a perfectly-worn, leather sling with exposed centre-seam fastened with oversized brass tacks, draped over a wonderfully-proportioned, elegant wood-board frame. Great subtle detail and perfect, much-desired patina from age throughout. 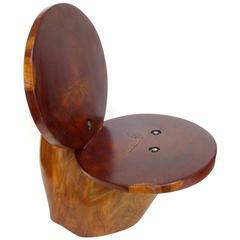 Very likely a one-of-a-kind, artisan built piece; an exceptional and impressive utilitarian element. 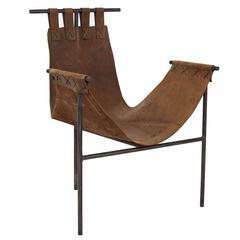 Modern steel and leather sling chair. A pair of leather and iron tripod sling chairs from the 1950s.